Kent, Ohio - Sorbothane, Inc. introduced an innovative system of interlocking Sorbothane® layers that can be customized to meet individual needs. Meticulously engineered 4” X 4” Sorbothane® pads can be layered and “locked” together to build a specific shock attenuating and vibration isolating assembly. A steel baseplate provides column strength and maintains the correct shape factor. A steel top plate can also be utilized. Layers of interlocking Sorbothane® pads are added - or removed - to establish the desired size and isolation parameters. Sorbothane® is recognized worldwide as the ultimate material for attenuating shock, isolating vibration and damping noise. No other material can dissipate energy as effectively. Sorbothane is a highly damped, visco-elastic polymeric solid that “flows” like a liquid under load. Unique applications call for unique solutions. Engineers at Sorbothane, Inc. are ready to help design the ideal damper or isolator to meet individual product objectives. For more information contact Sorbothane, Inc.
For more information send an inquiry directly to Sorbothane, Inc.
Sorbothane® is a proprietary, visco-elastic polymer. Visco-elastic means that a material exhibits properties of both liquids (viscous solutions) and solids (elastic materials). 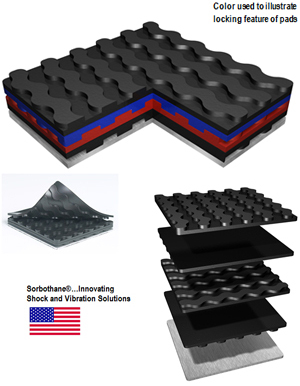 Sorbothane® combines shock absorption, good memory, vibration isolation and vibration damping characteristics. In addition, Sorbothane® is a very effective acoustic damper and absorber. While many materials exhibit one of these characteristics, Sorbothane® combines all of them in a stable material with a long fatigue life.